Cut chicken into bite-size pieces. In small bowl, mix chicken and salsa. Spray 1 side of 1 tortilla with cooking spray; place sprayed side down on work surface. Layer with one-fourth of the chicken mixture and 1/2 cup of the cheese. Top with another tortilla; spray top of tortilla with cooking spray. Cook in 10-inch nonstick skillet over medium heat 4 to 6 minutes, carefully turning after 2 minutes, until golden brown. Repeat with remaining tortillas, chicken mixture and cheese. To serve, cut quesadillas into wedges. Serve with sour cream and, if desired, additional salsa. If you can't find the refrigerated seasoned chicken, substitute 1 1/2 cups diced cooked chicken. Or skip the chicken, and use refried black beans instead. Try sprinkling some chopped tomato, green onion, and ripe olives or cooked corn kernels on the cheese and chicken before cooking. 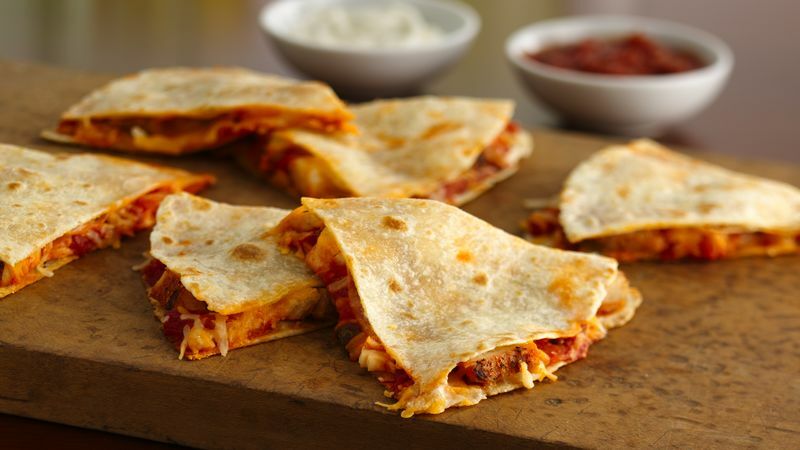 Make gooey quesadillas in a large flat skillet, on a pancake griddle, in a panini grill, or even in a hot waffle iron. Serve with not only the sour cream, but a selection of tomato and tomatillo (green chile or salsa verde) salsas or taco sauces.